Sadly, they didn’t, though I happily spent evenings in my hotel room in India channel surfing. Almost everything on TV, even an ad for instant noodles, had a dance number. Any joyous Indian gathering is not without dance and for further proof of its importance to Indian culture, ‘Nataraja’ is a ‘Lord of Dance’ and an incarnation of Hindu god, Shiva. Despite this importance, traditional Indian society doesn’t readily encourage its masculine men and modest women towards dance careers, especially in modern dance. By contrast, contemporary society embraces whole-heartedly as a source of fun, exercise and for the shot at Bollywood stardom. Films sometimes succeed solely by its song and dance numbers, which can make stars out of dancers and duds out of uncoordinated actors. To many, the prominence of dance in India today could not have been without a little magic from Shiamak Davar, one of Bollywood’s most influential choreographers. Davar fought the traditional mindset and taught his first dance class in Mumbai in 1985. He had been training in London and New York, and his unique fusion of Indian dance with musical theatre style jazz and modern styles attracted only a handful of students. Unfolding like a Bollywood film plot, his perseverance was finally rewarded with accolades for his 1997 film choreography debut in ‘Dil To Pagal Hai’, about a love triangle in a dance troupe. Besides snazzy dance numbers, this Bollywood classic is also a time capsule of three of today’s biggest stars – Shahrukh Khan, Madhuri Dixit and Karisma Kapoor – in their young, ingénue days. Despite Bollywood fame, Davar’s main focus is nurturing the Shiamak Davar Institute of Performing Arts (SDIPA), which teaches his trademarked ‘Shiamak Davar’s Indo Jazz Movement’ and ‘Shiamak Davar’s Bollywood Jazz’ to students worldwide. His mantra, ‘Have feet, will dance’, emphasizes that dance comes from within one’s soul. Can you blame me for wanting to dance in a Bollywood film? Think of dancing the Y-M-C-A with your friends, except in Bollywood, you have 20 times more friends, and you’re all much better dancers. Cameras can capture you from every angle. So if you’re having a good time, you’d better look like you’re having a really, ridiculously great time from all 360 degrees of yourself. And, be able to project that through multiple takes and many hours of rehearsal. After only 60 minutes of my Bollywood dance class, I was heaving for air and emptied my water bottle of the last rationed sip. The instructor, Rahul Manoharan, rallied us to dance the routine one last time. His beaming confidence in us took my mind off perfecting the steps to simply enjoying the dance. The lively choreography of bhumkas and jhabkas hit every thumping beat of the song and transported us to the colourful world of Bollywood. It was one of those rare times I caught a room full of strangers smiling ear-to-ear to each other. “Rahul, am I ready for Bollywood?” For the first time, Rahul’s optimism dimmed slightly. “Uh, sure, why not?” he replied, then quickly added, “If you want to be in a Bollywood movie, you need first to come to class.” He was right. I could barely get through a class. Anyway, if I don’t make it to Bollywood, at least Rahul brings Bollywood to every class. Bollywood Dance is a mix of dance styles performed in Bollywood films, including traditional Indian styles of Bharatanatyam, Kathak, folk styles, and modern Jazz, Hip-Hop or Belly Dance. Shiamak Davar’s Bollywood Jazz is one such mix with its own characteristics. 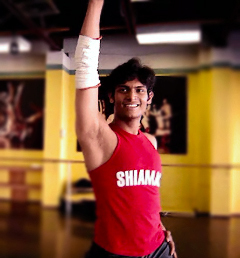 Where to dance Shiamak Davar’s Bollywood Jazz Shiamak Davar has schools in India and all over the world. Besides classes, there are workshops, performances and events throughout the year and many ways to bring Bollywood into your life!